Metro est un séquenceur intégrant la gestion du MIDI de l'audio et de la vidéo. 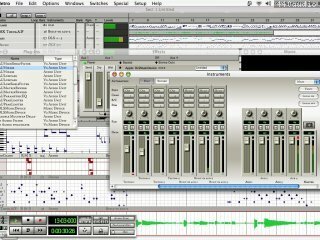 En audio il supporte jusqu'à 64 pistes audio, une table de mixage avec 8 départs auxiliaires, il peut utiliser les effets VST 2.0 mais aussi AudioUnits (OS X), tous les effets peuvent être utilisés avec automation. En MIDI il possède des fonctions avancées dignes des meilleurs séquenceurs professionnels, mais avec une interface simplifiée, pour le rendre plus simple à utiliser; son sytème MIDI supporte les technologies VST et CoreMIDI. En vidéo il supporte tous les formats reconnus par Quicktime, il est capable d'enregistrer de la vidéo provenant de n'importe quelle source, supporte les pistes vidéo multiples et possède tous les principaux effets de transitions. Apple Macintosh Intel or PowerPC processor (G4 or G5 required for the full version only). To use the software audio through feature a 450 MHz G4 processor or equivalent and a full duplex audio driver (a driver with synchronized input and output) is required. OS X, version 10.2 or higher required. 1 GHz intel processor or equivalent. Full version only: SSE2 required. Windows XP or greater, e.g. Vista or Windows 7. 64 MB free RAM minimum. 10 MB available hard disk space. For audio recording/playback, compatible audio hardware required. For MIDI recording/playback, compatible MIDI hardware required. ASIO support may require compatible hardware and/or drivers. Fast hard disk (7200 rpm) strongly recommended. Internet connection required for registration. Optional for web help. A crash could have occurred if the list editor was viewing effect automation and all automation was cleared from the instantiated effects window. Better VST compatibility with plug-ins that send automation from multiple threads (e.g. T-Racks). Worked around plug-ins that were not restoring their settings properly upon reload (e.g. T-Racks). Increment and save now works better when the last characters of the filename are numbers. In certain cases the instantiated effects window would change tracks when a subsection was selected. Entering Chord Mode could have caused a crash in certain cases. Certain combinations of undo and plug-in de-instantiations could have caused strange problems. Errors occurring during certain operations from the drum editor dialog were not being reported to the user. Loading old documents could leave the track colors using the previous color scheme. A crash could have occurred when using Subsections and using undo. Advancing through certain Arpeggiator presets or using the Arpeggiator copy and paste could have caused a crash. Enabling and disabling track looping while a cue loop is active now works properly. Several problems could occur if a plug-in was missing and all plug-ins needed to be scanned for a matching unique ID. If a previously successfully loaded plug-in failed to load (which is possible with jBridge for example), the instantiation count in the plug-ins window was being reset. Certain improvements to stability and usability in the Ultra Rhythm Explorer window. Miscellaneous fixes to improve stability and enhancements. ‘Save and increment’ in the switches menu. When activated, causes file names to increment on each save. The original filename must not end in a number to work as expected. The highlight color was not being restored when a document was opened in some cases. Certain quicktime audio files packaged as ‘.mov’ would not be recognized properly in the jukebox. Translucent image created when dragging files from the jukebox has been improved. An error when importing an audio file would be reported twice in some cases. More robustness when opening very old documents. In some cases opening a document without making any changes caused the file to be marked as dirty. Copying and pasting across documents now works for track inserts instantiated in a different section. In some cases, Rhythm Explorer was not inserting random chords when no notes were in the selection. The ‘SaganTechHostPluginInfo’ file could grow to large sizes unnecessarily. Dragging plug-ins from the instantiated plug-ins window works more reliably. Other feature enhancements, fixes and improved stability. The scope of track insert plug-ins has been changed to global. This means that insert plug-ins, such as soft-synths are now available to all sections. Any section can now be thought of as an instrument rack. The drum sets in the drum set selection popups are now sorted. The default multiple output setup is now configured via the plug-ins specification. The names of each of a plug-in’s multiple outputs are displayed in a help-tag when hovering over the output in the instantiated effects window. The automatic scroll edit delay has been changed to 4 seconds. Next and previous preset buttons have been added to the real-time arpeggiator. This is very convenient for auditioning arpeggiator presets. ‘No Pattern’ button added to the Rhythm Explorer when recording. The Sections window now displays the currently selected section with an outline when the window is not in front. VST plug-ins were not being correctly informed when they were being rendered faster than real time. This was causing Vienna Ensemble Pro 5 (and perhaps other plug-ins) to not render or mix correctly. The initial positions of the track windows data fields were being set incorrectly for the ‘SharpGray’ style. For example, the input vu levels were being hidden by default. A crash could occur if a plug-in was not sending automation in the correct sequence. A crash could have occurred if the number of mixer channels was less than 4. It was possible that bypassing effects could cause noise or buzzing when multiple zero input plug-ins were contained in the same plug-in chain. Plug-ins were not being informed of tempo changes immediately when playback was stopped. It was possible that an audio track would not initially play back if multi-core audio was selected. The display of an effect parameter automation could have shown incorrect data. Several memory leaks have been plugged. Better error message handling when a plug-in fails to load. If a plug-in with zero audio inputs was loaded in the middle of a effects chain, it’s data chunk was not being restored. The play bar color was not being restored properly when loading older documents (PC only). Rhythm Explorer recording has been made more robust. Selection filter display improved for ‘SharpGray’ style. Multi-core rendering was not working correctly in some cases (Mac only). MIDI record device selection was not working correctly until exiting and restarting. This bug was introduced in 7.0.2 (Mac only). Other feature enhancements and fixes. Help tag added for line tool. Custom popups work better when clicking and releasing right away. Changing the first output of a multi-out, from the instantiated effects window, to off would silence the entire plug-in even if other outputs were still active. Dragging a MIDI file to the drum editor did not recalculate the scrollable area. In some cases the effect parameter automation display would be incorrect. It was possible the track color swatch would be incorrect when loading older documents. There was no way to specify the pitch in poly aftertouch view when ‘sharpgray’ was the selected color scheme. SetChunk and GetChunk were being called even if the VST plug-in specified to not use chunks. For certain plug-ins (made with JUCE) it was possible that clicking in the plug-ins edit window would be disallowed erroneously when using the off-line effects processor (Mac only). It was impossible to select a track color on a track with no data or name. Certain plug-ins (Dimension Pro) could turn off help tags (Mac only). The metronome was not working in certain cases at high sample rates (Mac only). Sample rate conversion was not working properly when the source sample rate was very low and the destination rate was very high. Was not pausing and replaying wav files correctly in the jukebox if the file’s sample rate was different from the destination sample rate. The ‘sharpgray’ color scheme was not working correctly without administrative permissions. Some fonts were the wrong size in the ‘sharpgray’ scheme (Mac only). The track zoom pane button was not responding in certain color schemes (Mac only). The play bar color was wrong in certain cases (Windows only). If an audio input device was set to ‘off’ the selection of input devices would thereafter not show all of the possible selections (Windows only). A crash could occur in the Rhythm Explorer if drum mode was selected without ever setting the graphic editor to a drum view. A crash or memory related error could occur if a new track was selected while recording Rhythm Explorer patterns. Track scrolling via the scroll bar thumb was impossible in the ‘sharpgray’ color scheme (Mac only). Color scheme dependent transport time line feature. Color scheme dependent track colors. Color scheme dependent enhanced Mixer Aux feature. Better support for 64 bit float and 8 bit audio formats. System for users to create color schemes directly from a .msty file, .jpgs and .pngs. Newly designed color schemes submitted to us and accepted for general use will be rewarded. For more info, email “info at sagantech.biz”. View mixer channel inputs by simply hovering over mixer channel. Support for VST’s effString2Parameter. This allows users to enter parameters textually for (supporting) plug-ins with no UI. Better keyboard support for VST plug-ins. Last color scheme selection is automatically remembered. Highlight color saved with color scheme. Non-rotary entry of pan knobs (set as default). Help tags for Mixer window. MP3 preferences for writing ID3 tags in MP3 preferences tab. Tag fields include current year, artist, album and option for use song name as title. ‘Copy Markers as Chapter Text’ in Markers window option menu now works under Windows OS. Two new graphic editor quantize modes. “Absolute With Selection” works like absolute but also quantizes the selection. “To Vertical Grids” quantizes the selection to between the currently visible vertical grids only and is thus affected by the zoom level. Selections can also be quantized (in other modes) by clicking in a pane of the graphic editor and while holding the mouse move into the track title bar. More vertical zoom levels allowed. New continuous data “line” tool in Sharpgrey color scheme only. The line tool is available in other schemes by selecting pencil and holding the control key. Dragging simple MIDI files from plug-ins no longer stops playback. Remote control allows remapping of pitch bend events to an entirely different range. Set out range to -3276 to 3276 for NI Monark to bend in a 2 step range. Better OS X Mavericks and Windows 8 support. Column header selection in the tracks window by right clicking the column header. The limit in Metro LX has been increased to support 28 effect plug-ins or 7 synthesizer plug-ins. Effects outputs busses not in use, no longer increase the audio track counts for Metro LX and Metro SE. After step entry it was possible the loop length of a track could be incorrect. Better support for automation for effects/synths placed on mixer channels. It was possible after running the PPC version and then the intel version that the sagantechplugininfo file would be corrupt or the discovery dates would change to invalid values (Mac only). Key changes are reflected in the transport immediately. Move/Copy notes in multiple panes of the graphic editor simultaneously was not always working properly. Loop recording would, in some cases, incorrectly set the loop length. Arrow controls were not always working in the preferences dialog (Mac only). Fixed memory leak when using plugins with a Cocoa based UI (Mac only). Improved text drawing using Quartz (Mac only). Compatibility with OS X 10.3.9 restored (Mac only). Metro (Quicktime) could hang when importing more than one audio file via drag (Windows only). Access violations in the closing of a plugin (jBridge) and in some other cases (Quicktime file conversions) are now caught and do not cause the application to crash (Windows only). Fix for VST plug-ins that start with their preset number out of bounds (preset > number of presets) e.g. IK CS-Metering. Was possible to mute and solo drums at the same time. Custom favorite controllers (associated with a program name list) are now saved properly. Deleting a subsection while it was being played in a cue loop could have caused a crash. Delete and insert time now correctly select the notes that moved into the selected area. Was appending a ‘Temp’ to the default file name on export track in some cases. The keyboard window would continuously steal focus from the list event editor in some cases (Windows only). Convert to ‘FLAC’ could cause a crash in some cases (Windows only). Fixes for clicks in help tag window and flashing help tags (Windows only). Arpeggiator pattern indicator was not erasing in certain cases (Windows only). A crash could occur if an internet proxy was in use during startup while Metro was looking online for the latest version number (e.g. on an airplane) (Windows only). Was not writing 8 bit audio files properly (Windows 64 bit only). Possible to now change tempo without stopping playback as long as there are no audio files in section. Plug-ins saved in preferences were in some cases not being restored properly. Dragging in certain windows now scroll or scroll more easily e.g., dragging a track number. Generally more stable and efficient code. Many other feature enhancements and fixes. • Support for VST plug-ins that change the number of parameters on the fly like these from Cockos. • Automatically set the initial category of a VST plug-in when it is instantiated for the first time, if the plug-in includes a category. • Count-off was not working properly if a soft synth effect was placed on an aux buss and the aux buss chain had latency. • A plug-in could mysteriously disappear after multiple plugs were rearranged and then the undo buffer was exhausted. • More robust error checking for .fxb banks written incorrectly. • Mixer MIDI ports could be mixed up after a ‘New’ if preferences were saved. • Dragging an audio sample could bring up an erroneous error message. • Numerous other bug fixes. • Multiple simultaneously running independently assignable arpeggiators. Each track can be assigned to one of the eight arpeggiators. • Each arpeggiator step can revolve up and down one or two different musical scales or chords. • Compatibility with Korg Triton arpeggiator including import of Korg Triton arpeggiator system exclusive data. • Fixed note method for drum patterns. • Alternate Strumming (flam) makes it easy to switch flam at each arpeggiator step. • Flam can be specified at each arpeggiator step for customized strumming. • Pattern changing/looping make it easy to create long patterns or programmable arpeggiator pattern changes such as key switching. • Remote control events can be used for pattern switching and can be configured via MIDI learn. • Each pattern can have an independent base scale. • Keys modes, specifies if notes are sounded in addition to arpeggiated notes and more. • Arpeggiator presets can be saved individually or as a complete set. • Keyboard window is resizable horizontally. • Ties in the arpeggiator window are more intuitive now. • Legato duration step will play until another step plays the same tone or until the end of the pattern. • Dragging MIDI files to arp window selects fixed note method if initiated in a drum view. • 100’s of presets included. • Transport’s ’Stop’ button stops arpeggiator latching. • Much more.• Remote Control events are now in three user selectable and independent categories; Persistent, Document and Arpeggiator events. • The onscreen keyboard window step velocity is saved with the Metro document. • Contextual ‘View’ menu in the mixer window allows mixer channels to be viewed via ‘Show All’, ‘Hide MIDI’, ‘Hide Audio’, and ‘Hide Selection’ commands. • Mixer Channels can be rendered via the Mix Or Render Tracks dialog. • Background color for continuous data view can be specified in the general preferences dialog. • Swing is ignored if the quantize is a quarter note or greater. • Plug-ins with no GUI look better in the plug-in rack. • Menu item to add ‘new aux buss’ in the output popup of the instantiated effects window. • Help tags for the keyboard window. • Default number of undo steps increased to 48. • Alt (option on Mac) + Shift quantizes selection to note editor quantize settings. • Double-clicking on the punch-in or metronome buttons in the transport opens the respective dialog. • Rescan audio devices in the Digital Audio setup dialog (New for Windows only). • MIDI Thru was ignoring a track’s transpose setting. • Copying and pasting tracks unassigned to any mixer channels would sometimes not preserve the original tracks output port. • Better cross platform compatibility. • Recording with the selection filter enabled would produce unexpected results. • Sample rate conversion would not work properly in some cases. • Virtual Instruments note on and note off are ordered more precisely when they start and end on the same MIDI clock. • Expand track loops was off by one MIDI clock per iteration. • It was possible, in certain rare cases that a note would lose some of its parameters when dragging its pitch up and down. • Count-off was not working if a plug-in was placed on an aux buss or a mixer channel. • It is now possible to drag MIDI files from other programs to the keyboard window arpeggiator section. • Plug-in Bypass was not always working properly. • In chain mixing of multiple zero audio input plug-ins was not always working properly. • A crash could have occurred when opening older Metro documents if ‘ignore window positions’ was selected from the switches menu. • Transpose Markers works properly now. • Revert would fail for Metro stationary documents. • Mix or Render initiated from the sections window now works as expected. • It is now possible to import multiple audio files in one step by dragging them into the graphic editor, tracks window or dropping them on the application icon. • support for jBridge. If jBridge is installed, any encountered 32 bit plug-in in a 64 bit environment (and visa versa), will load as a bridged plug-in automatically. • When editing subsection in real time, some changes would not be noticed until playback was restarted. • Output ports in the define output dialog and in the mixer window were not being shown correctly in certain cases depending on the scope. • Expanding subsections would not assign and create the correct mixer channels if multiple tracks were assigned to a soft-synth track insert within one of the subsections. • ‘Trim outputs to Tracks’ was erroneously removing outputs that had plug-ins instantiated on them. • Metro LX was not allowing 32 bit audio output to be selected in the ‘Mix or Render tracks’ dialog. • A crash could have occurred when using the spray paint tool into a drum view. • The newer spray paint modes have been enhanced to better work with drum views. • Verified Windows 8 and Mountain Lion (10.8.x) compatibility. • Plug-ins can now be placed on mixer channels. This makes it easy to do complicated routings, for example, taking a stereo pair of a multiple out plug-in and routing it to a reverb. • The maximum number of audio tracks has been increased to 128. • Saving of standard VST programs (.fxp) and bank (.fxb) files. You can now use Metro to organize and save cross-platform industry standard preset files and banks. • The graphic editor duration can be divorced from graphic editor quantize value by clicking on the note duration popup while holding the command key (Ctrl key for Windows). This makes it easier, for example, to input quarter notes at sixteenth note boundaries. The two settings can be synchronized by selecting the same quantize value as the current duration. After synchronization, selecting the duration selects both quantize and duration. The synchronization feature makes it more compatible with the way older versions worked. • More efficient VST plug-in support. • The normalize dialog, now shows the percent the audio is current normalized. • Bridged VST type added to Plug-ins window if the plug-in is jBridged. • Rhythm Explorer window is floating. • Rhythm Explorer adds the possibility of ghost notes to drum algorithms. • Rhythm Explorer adds indicators for different drum algorithms in use. Little black, red and white triangles denote “extra hits”, “ghost notes” and “ride cymbals”respectively. • Rhythm Explorer add a preference for note range and adds recordable octave transpose buttons. • Instantiated plug-ins on mixer channels and aux busses are saved with preferences. • Notepad editor supports color, multiple fonts and font panel settings and now saves internally in RTF format making it more cross platform compatible. • High quality text in Notation window and printing. • Preset numbers draw in the graphic editor for instantiated plug-ins. • Instantiating a plug-in assigned to the drum-machine category, from the graphic editor, automatically switches the graphic editor to drum mode. • Option to use velocity pattern defined in the real-time arpeggiator with the spray paint tool. • New option to detect chords from MIDI on a track and add them as markers. This is extremely useful for supplying accurate data to the Rhythm explorer. • Chord detection in real-time in the keyboard window. • “Add fadeout automation” added to contextual menu for each mixer channel in the mixer window. • “Input select” added to contextual menus in the graphic editor track title bars and the tracks window. • Right-clicking the time signature in the transport window brings up a quick time-signature change popup. • Markers can be transposed via the transpose dialog. • “Not Multi-Core Compatible” option, when checked for an individual plug-in, will instantiate a plug-in on the main thread so that threading issues do not occur. This is important for plug-ins built using SynthEdit as they are not normally compatible with Multi-Core digital audio workstations. • Hold the shift key when opening a closed plug-in to reset the plug-ins edit window size to the default size. • The jukebox will continue playing across document opens and ‘new’ if there are no in use aux busses and no effects on the master buss. • When cue-looping playback, the pitch bend state is saved at the cue-loop start point and restored at the cue-loop end point (for one MIDI channel only). • Menu option “Snap External Drags To Measures” added to the Quantize Mode menu. This makes it easy to drag audio or MIDI grooves from the OS or a plug-in editor window and have it quantized to a measure boundary regardless of what the current graphic editor quantize setting is. • A back arrow icon appears in the graphic editor when editing a subsection. This allows easy access back to the parent section. • A track’s previous view is memorized so that when it is switched to a continuous data view (e.g controllers) the underlying display is correct(note or drum). • The last selected controller, for when a track is in controller view, is memorized. • Subsections with soft-synths now produce audio accurate to 1 MIDI clock. • Latency compensation now works on aux busses for synths that have no audio inputs. This version also supports latency compensation in the middle of plug-in chains. • Several memory leaks have been fixed. • Tempo changes were not being accounted for when calculating the duration of a note on a soft-synth assigned MIDI track. • Input and Output contextual menus are more thoroughly implemented. • Better default directories for loading and saving different file types. • Stale soft-synth mixer channels were being saved in Metro documents in certain cases. • The tempo was notated wrong in the notation window if the time signature denominator was not 4. • Plug-ins no longer re-sort after selecting a category. This makes it easier to categorize multiple uncategorized plug-ins. • A stack overflow could have occurred if there were too many plug-ins (DLL’s) found. • Writing mono MP3 files was not working correctly in some cases. • Many other bug fixes. • Rewire Support: (New for Windows, enhanced for Mac). An option to show all Rewire channels has been added to the Rewire menu. By default Metro will now only create ports for Rewire channels that accept MIDI notes. If this option is checked it will create ports for all Rewire channels until it hits the limit of 128. • The drum name area of the Graphics Editor is now sizeable. • Rendering audio via the ‘Mix or Render Audio Tracks’ menu item when a Rewire port is selected has been fixed. • The size of the drum mute and solo buttons have been increased. • Using the mousewheel to scroll horizontally in the Tracks window during playback is improved. • Several bug fixes and feature enhancements. • Metro is now also a Windows 64 bit application. The 64 bit version was completely rewritten to not require QuickTime. It includes full mutli-core support and custom optimizations for SSE. • Ripple editing is now supported with the use of the option key (alt key for windows). e.g. Cmd+Option+V will insert time before doing a paste for the length of the data on the clipboard. Alternatively you can hold the option key when selecting delete, cut or paste from the edit menu. • Spray scale draw mode is a new mode of the spray paint tool which allows easy entry of riffs in a selected scale by simply clicking and dragging in the graphic editor. The duration can be changed on the fly and swing is fully supported. • When entering numeric data in the graphic editor’s note edit dialog, floating point values are accepted in the bar, beat, duration bars and duration beats fields. e.g. you may enter 3.5 for the bar field to set the note to trigger in the middle of the third measure. • The home, end, page up and page down keys are now supported in the plug-ins window. • Metro SE users can now output audio in hundreds of additional formats using QuickTime. • The port change dialog has a new checkbox ‘conform out of range audio outputs’ that, when unchecked, lets you retain your track input selections in case you have changed the output device temporarily. • Loading a document with a missing plug-in will show the name of the missing plug-in, if possible. • Initially upon recording, especially under the Lion OS, a long delay would occur. • Many fixes and enhancements to the notation window. • A crash could have occurred in the remote control window when selecting an input device. • Independent track loops were not expanding correctly when expanding subsections. • Swing is now ignored when quantizing tuplets/triplets. • In rare cases ‘expand by channel’ could have caused a crash. • In rare case it was possible that a full sequence paste would not paste 100% correctly. • It is now possible to move around project folders and have them still open without errors under windows. • The duplicate command replaces instead of merging data. Sagan Technology has announced the release of version 6.5.0.1 of Metro, the complete cross-platform digital audio workstation solution for both Windows and Mac users. Metro, Metro LX and Metro SE are available now directly from the Sagan Technology Store. Support for documents with a very large amount of measures (Previous limit was 9999). Record MIDI from VST plug-ins by selecting the input device from the tracks input device column popup. The plug-in must have 'record' enabled via the plug-in's contextual menu popup before it will show in the input device column popup. This makes recording from VST's more consistent with regular recording. Support for documents with more the 4 billion samples. In the graphic editor the cursor changes to show what will happen on a mouse click. When an existing file is overwritten (via save) Metro now copies the old file to a temporary file named 'tmp.bysq' and then after the save is successfully completed, the temporary file is deleted. This makes it possible to recover any file in the case that some catastrophic hardware or software error occurs during a save. Horizontal and vertical zoom in the graphic editor are saved and restored across application launches. Metro now writes VST chunk data in one pass. This was causing a severe problem with certain NI plug-ins that change the length of their chunk data (seemingly randomly) over two consecutive calls. The problem could manifest in data file corruption or a crash. In certain cases the transport window would now have the correct visibility when a document was opened. Certain edits in the Effects window would cause the track to mysteriously change. When loading plug-ins, audio output channels are verified and if necessary, conformed. Previously this minor problem could result in missing outputs in the output contextual menu. Help tags were interfering with clicks in the Effects window if an effect had no editor. Dragging notes in the graphic editor did not work properly if the switches menu 'Playback Scrolling' was set to 'All'. Drag and drop is more accurate in its destination times especially when originating from the Jukebox window. Dragging files from the jukebox now shows the file being dragged with transparency on the PC (already did so on Mac). No checking for a new version is performed until the about box is manually shown and checking for a new version is selected in preferences. This works around a bug in certain versions of Quicktime that causes a crash when no internet connection was found. Cueing past the end of an audio track would sometimes not playback properly. Smoother audio playback on start and stop. In rare instances Software Audio Through would inexplicably become disabled. Weird problems would occur on playback if an old offline audio device was selected in an aux buss. Metro now displays an error. Translucent dragging now supported under Windows XP. For long sysex messages a progress dialog is presented (Windows only). A crash could occur if the sections event windows was following play back and a different section than the currently playing section was selected. The continuous audio data dialog now applies to the current selection. The values outside of the current selection are restored. The continuous MIDI data dialog would only work correctly if the current controller was selected in the graphics editor window. Slightly faster drawing of digital audio overviews. It was difficult, if not impossible, to resize a very small digital audio region (one pixel) in the graphics editor by grabbing its resize handle. It is now easier to select notes with very short durations. It is now easier to click on the downward pointing triangle in the Effects window. Workaround a Windows 7 bug whereby upon selecting a folder the default would be out of view. Dragging of bar lines was difficult if edit quantizing was enabled. Opening an old Metro document no longer sets the columns in the track window incorrectly in certain cases. Real-time editing when a subsection was selected could cause problems. Undo was was resetting the selected tracks incorrectly in certain cases. Re-scanning plug-ins from the plug-ins window with no plug-ins failed. • First windows version with standard music notation and printing. • Notation sizing option allows notation to be bigger or smaller. • Drum symbols can be specified for standard music notation drum tracks. • Real-time dragging gives you what you see is what you get (and what you hear) in real time while dragging. No more grey outlines for most dragging operations including standard music notation. • Spray can tool has been signigicantly enhanced to include the scale spray and the phrase paste feature. The scale spray feature allows the user to draw and drag scales in real-time with the duration specified optionally by the end of the drag (fit to drag) or by the graphic editor step duration. The phrase paste feature allows the user to drag and draw copies of the clipboard, multiple times, transposed by the cursors y position. Double click the spray paint tool to set spray paint tool options. • A new row for specifying the note index combination (chords). Any combination of notes of the first 7 notes being played can be specified in each step of the arpeggiator. • Better display of rests. • MIDI learn (right-click) for "arpeggiator on" and "pattern select" functions. • Record generated notes only option for recording MIDI data that is generated by plug-ins only. This option is accessed from the effects window by right-clicking on an instantiated plug-in that is able to output MIDI. • Global highlight color specified in preferences is saved and restored with the Metro document. • Plug-ins window support sub-sorting so that if the user changes the sort column, the previous sort column becomes the secondary sort criteria. • Plug-ins window has an option for re-scanning plug-ins. This function forces the user to save or discard the current document before it rescans. Useful if you were already running Metro when a new plug-in is installed or, under windows, if you change the default plug-in location from preferences. • Clicking on the support or sales email address in the about dialog brings up the default email program. • A warning message shows in the graphic editor when software audio through feedback protection is activated. • Improved cross platform document transportability. • Outputs added to the graphic editor track titlebar's contextual menu for Aux buss and Master views. • In the graphic editor Master view, Add Fadeout Automation, added to contextual menu for quickly adding a fadeout to all tracks. • User specifiable VST plug-in parameter ranges by clicking on the ranges in the graphic editor. These ranges are maintained for each plug-in. (Not supported on PPC computers). • The demo version will print one page of notation with a water mark. • Better automatic notation and many fixes to the notation engine. • A looped audio track cued beyond the end may not have cued properly. • In some cases the Render function of Mix or Render Tracks would not render the first audio buffer. • It was possible to view aux send volume and aux send pan even if there were no aux busses. • Some audio settings were not being restored properly. (Windows only). • Audio waveform data out of range could cause graphic anomalies in the graphic editor. Other minor cosmetic changes to the waveform display. • In rare cases it was impossible to switch out of SMPTE Display or Bar Display mode from the switches menu. • Metro was not honoring if a new version of a plug-in changed its editors window size, usually causing truncation. • The audio setup dialog comes up automatically if no audio devices are specified at startup. • The current duration is restored properly even if the parts per quarter note has been changed. • Rhythm Explorer will no longer auto revert the current track just because the selection has changed. • Track and selection properly restored after an undo of the Harmony function. • Notation window could lose its status bar and/or tool bar after resizing. • Metro will now always change the track duration after the insert time or delete time function are performed. • Duplicate aux buss names could have resulted from a paste operation. • The waveform icon in the graphics editor that appeared only when an audio track was active has been removed since it was inconsistent to have that option be selectable only for audio when it also affects the way MIDI is edited. It remains in the switches menu as Region Editing. • Improved paging support for popup menus with massive numbers of items. • Groove quantize failed if the PPQ (parts per quarter note) was changed. • If an input audio port was out of range and there were no audio inputs an out of range error dialog would pop up. Now it is simply ignored. • Switching a tracks output from soft synth (vsti) to MIDI or visa versa could have affected the timing of that track. • Holding down the control key causes Metro to not check for new versions when the about box is displayed. In certain versions of Quicktime, when no internet connection is active, this could have caused a crash. Usually on startup. • Slightly less sensitive software audio through feedback protection. • Adding/subtracting values in the continuous data dialog to audio volume works more consistently. • A crash could have occurred when changing audio devices (Windows only). • In some rare cases it was possible that the Metronome would not function. • A compiler bug was causing Chord Progression insertion to fail (Mac only). • Dragging all tracks in the tracks window down and to the right could have caused a crash or other problems and was not undoable. • Canceling out of the mix or render dialog could have brought up an erroneous error message. • It was possible that audio recording could end prematurely. • Several other fixes and feature and performance enhancements. * This is the first version that has been compiled cross platform from the same sources. * Import Lyrics file option allows the importation of lyrics as lyric markers. The lyrics are automatically aligned to notes on the current track. Lyric markers can also be re-aligned by right-clicking and dragging a lyric marker to the correct location. All other lyric markers on the track are then aligned to notes accordingly. * New option for selecting the marker type (Lyric, Marker or Copyright) in the marker edit dialog. * New option added to the Duration Dialog for scaling duration. * Chord quantize added to quantize dialog allows user to quantize chords without changing the relative positions of the notes inside the chords (Full version only). * Step duration and options (triplet, dot, etc.) now saved with Metro document. * Limited support for VST parameter display mapping since few to no plug-ins support it. * New dialog box (windows only) detailing timing info on why Metro stopped when 'strict plug-in profiling' option is selected. * New plug-in option 'Resume Before Progam Change' required for some GSI plug-ins (like KeyPerformer) to behave. * Help tags (new for windows only). * New drums are automatically added when notes are entered and the track is in a drum display mode. * New option for automatically starting automation record when record is pressed, in the record setup dialog. * Missing plug-in are not removed upon instantiation of a new plug-in, so that one can use the change ports dialog to assign all of the other tracks in a multi-timbral setup. * New option for showing 'all file types' in the open dialog. This makes it easier to open cross-platform documents that do not have the correct Mac file type or Windows file extension. * Mix file type and sample bits are now saved from the mix/render tracks dialog. * A couple of new items have been added to the track contextual menu. * Support for Mac OS X 10.3 has been restored. * Vastly improved windows multi-processor support. * Vastly improved handling of what happens when a plug-in is pasted across documents. * Recalculates track positions correctly when the loop icon is toggled in real-time. * A crash could have occured after real-time audio transpose. * A crash could occur depending on remote control display settings. * Improved handling of 32 bit little endian audio files. * In some cases Aux VU's were not updating in the mixer window. * The factory metronome could get unexpectedly muted or could sound at the wrong time under certain circumstances. * Improved defaults in the Port change dialog. * Many improvements to non-ASIO windows audio, including external MIDI synchronization improvements. * Playback looping is consistent now when two or more tracks have the same length and one is looped and the other is not looped. * Switching between jukebox and transport playback improved. * Metro document was being marked changed in some cases when it was not. * Increased the space before the time in the list editor making event selection easier. * When an ASIO device was selected, Metro was producing an audio glitch on stop in some cases. * During the loading of a Metro document, if a missing plug-in was part of a plug-in chain it was possible that the existing track's plug-in automation could be assigned incorrectly. * Master VU clip indicator did not light in certain cases when it should have. * Many other bug fixes and feature enhancements. • Fast forward implemented in the windows version. • The Master output is now auto-unmuted upon startup. • Copying and pasting to empty tracks did not always restore the copied outputs. • Pasting tracks assigned to virtual instruments into a new section, in some cases, would not create new outputs properly. • Depending on the multiple monitor configurations, Metro popups could occur on the wrong screen of a multiple monitor setup. • In some cases missing ports were not being reported by the Port Change Dialog. • The dragging of regions in the track editor was not working properly if the start of the selection was not visible. • Work around for Quicktime problems provides better stability when editing movies (Windows only). • Handle shut down properly (Windows only). • First windows compatible version including cross platform file compatibility. • Program names are automatically saved when exiting the program names dialog. • A fix providing compatibility for MeldaProduction plugins. • A hang could occur if Metro was started by double-clicking on a document. • Importing an old drum set document into the Intel version could cause a crash. • A crash could occur in rare instances when a new track was created. • A crash could occur when dragging a plug-in from the effects window while the transport is engaged. • The real-time arpeggiator was not handling ties correctly in some cases. • Auto-assignment of bank and program from MIDI data is improved. • Change ports would occasionally not change virtual instrument audio ports. • Trigger MTC sync now works properly. • Although not visible, the graphic editor would continuously refresh in certain situations. • In some cases plug-in data would not be restored properly upon document reload. • A crash could occur in rare cases if a document written by Metro was read by SE or LX. • It was possible that a lockup could occur when opening a bundle file. • Opening an old documents was not setting the graphic editor vertical scale property properly. • Not all of the help menu items were functional properly on intel macs. • The default for newly created outputs is to not reset Modulation (controller 1) on playback. • If the switch 'edit notes in selection' was not checked, recording could be erratic. • Optional native support for .caf files. The user can decide to use .aif or .caf as the native supported audio file format. .caf has the advantages of not being limited to a 2 GB file size and data recovery, in the unlikely event of a crash. It has the disadvantage of not being supported by certain Apple applications even though it is an Apple file format. • The mixdown dialog, when 'to track' is selected, now brings up the export dialog allowing the user to select a final mixdown file type and more. This allows direct mixdown to .mp3 or .aif for example. • Preference option allows the user to decide if the tracks and graphic editor windows keep tracks in sync or not. • The 'don't show audio glitch dialog' setting is permanent and can be set in the preferences dialog. • Support more zooms. The user can now zoom out much further in the graphic editor to get an overview of large audio files for example. • Support for vertical grids when in notes mode of the graphic editor. • Global warnings in the graphic editor display: "8 Bit audio","Sample rate converting" and "Track Frozen". • Keyboard equivalents for Fade and Cross Fade. • Jukebox window live resizes. • Filenames are now automatically copied to audio region names. • Stereo Vu's in the mixer window. • A plug-in contextual menu item option to 'retain editor on close' prevents Submersible Drumcore 3 from crashing when its window is closed. • Options for selecting colors in the Jukebox window's contextual menu allow the user to customize the look and also view song titles from great distances. • Jukebox option for 'highlight now playing'. • If a newer version is available it will be shown in the about dialog. • Arpeggiator additions include a new set input key range button, and a diatonic switch that replaces the 'diatonic chords' method so that diatonic support is available within all arpeggiator methods. • Dragging MIDI files (or MIDI regions) to the keyboard window to extract arpeggiator settings now possible. • When a plug-in cannot be found, its name is now included, if possible, in the error message. • Startup time is drastically reduced for users with long lists of plug-ins as plug-ins are now scanned on a separate thread. • Clicking on the 'No.' header in the jukebox window when a file list is already shuffled reverses the order of the shuffled list. • Option to sleep computer after jukebox finishes. Good for using Metro as a sleep timer without wasting power all night. • Copying and pasting plug-ins from an aux buss would sometimes create extraneous instances of plug-ins. • After using the Jukebox plug-ins may not be automatically re-activated until regular playback. • Keyboard window would not close with command-W if Transports was in front of it. • Metronome was unnecessarily sample converting in some cases. • Using the arrow keys to shift automation data now works for automation data on aux busses. • Restore outputs could have caused a crash. • Non-existent track names no longer are written to MIDI files with the name "Untitled". • Canceling a save could have caused the undo history to be purged. • Using the continuous data dialog to modify data on an aux buss would not have an immediate effect (playback would need to be restarted). • Using the continuous data dialog to modify data on an aux buss is now undoable. • Better drawing of the graphic editor when zooming out. • Better performance during mixdown. • Scroll horizontally with a mouse wheel no longer conflicts with playback scrolling. • Vertical mouse wheel scrolling now works correctly when hovering over the graphic editor track's title bar. • The default MIDI continuous controller display is now 1 (modulation) and not 0 (bank change). • in some rare cases track views would mysteriously change. • Extending the selection by using the shift + '[' or shift + ']' in the graphic editor did not work if there were aftertouch data in the track. • WAV files would not import properly in some instances. • Unplugged audio devices are now remembered until a new audio device is selected. This is in case the device comes back online. • The glitch dialog could come up at an inopportune time that could cause Metro to be in a situation where the only option was a force-quit. • Erratic playback was occurring after punch out in some cases. • Import audio was failing in some rare cases. • Batch converting files using the 'convert via quicktime' option would fail in some cases. • Long plug-in names were wrapping strangely in the loading plug-in progress dialog. • Plug-ins in the plug-ins window are now resorted, if necessary, when their number of instantiations changes. • Default to midi view if audio is off when a plug-in that supports both audio and MIDI is instantiated on a track. • Vastly improved consistency and performance when switching from cue to playback with audio tracks. • Vastly improved consistency and performance when doing realtime audio edits. • Problems with 8 bit audio have been addressed. • Standard MIDI device names. • Improved arpeggiator algorithms when not in auto sync mode. • In some cases Metro would let the user record at a sample rate or bit size that was incompatible with the current track. • The selected track could change if a record error occurred. • Pasting audio automation would fail in certain cases if multiple sample rates were in use. • The jukebox would report certain WAV files as all being 'untitled' instead of displaying their file names. • It is now possible to start the jukebox playing in the middle of MP3 or other file formats. • When the jukebox stops playing files are closed so that external drives can be ejected. • Erroneous error message could popup if an audio devices was changed, the input was out of range but then resolved. • The scale tempo setting in the scale time dialog is now remembered. • The graphic editor pitch bend display would display incorrectly under certain circumstances, more commonly when zoomed in. • After dropping audio, the current play position and other setting would be unnecessarily reset. • After an audio device input select port is detected out of range, the default input selection is now reset, reducing the number of error messages presented. • Metronome instantiations are no longer recorded or reflected in the plug-ins window. • Possible crash when dragging a side-chained plug-in to an aux buss. • The duplicate command moves the selection more accurately. • Once a track's bar length is set, minor edits to the track will not reset it. • Automation could only be recorded on a remote control mapped effect parameter if the parameter was assigned to the first plug-in in a plug-in chain. • Using the '[' or ']' keys could cause a hang in the graphic editor if there were MIDI data on the track but no notes. • Expanding track loops that contained data past the end of the track could cause some strange anomalies. • Remote Control presets were updated to support the new MIDI naming conventions. • Remember the last controller view for each track. • Option in plug-ins contextual menu 'Do Not Set Program On Open' works around a problem with Vember Audio's Surge. • Option in the real time arpeggiator for auto sync. When off sync is free running and no longer relative to the bar and beat position. • Option in the real time arpeggiator allows the user to set the number of velocity steps independent of the number of rhythm steps. • Further optimizations of the audio engine. • It is now possible to copy or cut a sequence and have the plug-ins instantiated on aux busses restored on paste. • Maximum system exclusive (sysex) buffer size has been increased to 2 megabytes. • Clearing a track that contained only MIDI controller automation data would not immediately refresh properly in the graphic editor. • The ability to import via drag and drop, larger MIDI files. • Better core audio support. • Improved on the fly audio recording including overdubbing muting inappropriately. • Undo of a section clear now works properly. • In some cases remote control would stop functioning after the play head passed the record punch out point during punch-in recording. • In some cases mixing tracks would not produce audio if certain tracks were muted. • Exporting a movie was not explicitly setting the default playback rate to normal speed. • Shifting certain automation data when no audio exists would sometimes fail. • Jukebox would update mysteriously after last song played if overall looping was off. • Using the scale time feature on an audio and MIDI track would sometimes fail on the MIDI side. - Plug-ins names and locations are now contained in the editor window's title bar. - Section event window has a new, more OS X like, look. - Most windows can now be live resized. - New plug-in parameter lets user choose the Edit windows preferred user interface, carbon or cocoa, if plug-in provides both. - More accurate tracking of the pitch bend wheel in the keyboard window. - The note and select note colors are now saved with the Metro document. - .AIFF files written with a type of 'FL32' are now correctly interpreted as 'fl32' (32 bit floating point format). - Subsection event edit dialog now contains an edit button to go directly to the subsection. - Rewire functionality has been restored. - Core Audio support improvements especially after sleep. - Minor enhancements to drag and drop. - Improved tracking of default drum sets. - Muting/Soloing of frozen tracks was not working correctly. - The glitch dialog is back. - Plug-in searching is improved. - An error message is presented if the user tries to save a scale or chord starting with a '-'. - Clearing outputs while playing could leave vu's meters connected to wrong outputs. - In some cases chasing master volume would not work correctly. - Changing presets via external MIDI controller was not updating preset display in the graphic editor window. - Certain color schemes have been fixed. - Restore outputs could lead to a crash if plug-in was instantiated on an aux buss. - Undo of a MIDI file drag is improved. - Fast forward works regardless of priority setting in digital audio dialog. - The keyboard window no longer erroneously intercepts keys from the plug-in or section event editor windows. - Dropping subsections into the graphic editor are no longer quantized to the bar level. They are now quantized to the selected quantize value. - Fixed minor cosmetic issues. - A crash could occur after opening very old Metro documents. - Improved Cocoa plug-in edit window support. - Pressing play from fast forward mode now correctly cancels fast forward mode. - Certain problems with VI's in subsections have been addressed. - Cutting twice in succession in the sections window was not working properly. - The default port (set from the edit port dialog of the tracks window) was not being restored properly in some cases. - In some cases MIDI ports would disappear. - Multiple (MIDI) files can now be opened upon startup by dragging them to the Metro Icon in the finder or dock. - Keyboard repeats generated by holding keys down were being ignored. - 32 bit integer .AIF files were not being written correctly in certain cases. - Plug-ins names and locations are now contained in the editor window's title bar and windows menu. - When a plug-in with no inputs (synth) is placed in the middle of an effects chain, the output is now mixed into the chain. This means that layers with some really cool and fat sounds can easily be created simply by placing multiple synths in the same chain. - Chasing dialog allows an option for chase on record and/or play now. - The '<', '>', page-down and page-up keys now work in the event editor if it is the frontmost window. - Improved error handling when an audio device disappears and reappears (usually USB). - New option for contextual plug-in popup, 'Filenames are preset names'. When this option is checked Metro will use the filename (.fxp), instead of the embedded preset name, in its preset popups. - Faster launch times for those that have many plug-ins. - New fields in the plug-in window, Discovery (date not channel) and Instantiations (number of times plug-in has been loaded). - Profiling audio plug-in performance adds the track name or aux number to the printed information. - Search field in the plug-ins window (The window must be made wide enough to see this field) makes it easy to find particular plug-ins. - Horizontal scroll bar in plug-ins window. - Realtime arpeggiator display always moves when enabled. - Playing notes when the transport is idle now plays the note for the correct duration. - A plug-in editor window was drawn all white the first time after a document was loaded. This could occur rarely depending on the plug-in. - After saving a AudioUnit preset, the default preset was wrong. - Human dialog could set note velocities to zero causing them to not sound. - Using the arrow keys to shift automation data would cause all automation to be shifted. Now it only shifts the selected data. - Using command-arrow to decrease duration could, in some cases, cause the note to be changed to a long note. - Software audio play through now works more consistently. Support for Cocoa UI AudioUnits. - Search field in the plug-ins window. - VST support for plugins with outputs up to 128. - The graphic editor adds swing, volume and pan fields. - When the program starts a new progress dialog shows the plug-in scanning process. - When the graphic editor is zoomed way in it is now possible to select multiple measures by clicking the black bar number. Also tics represent single measures in this view. - Expand subsections now adds the subsection names as marker to the expanded sequence. - Audio Unit Generator types are loosely supported. - If a media file cannot be deleted, usually because it is selected in the finder, it is moved to the trash instead. - Setting the 'Let Plugin Resize Edit Window' flag now prevents the plug-in's edit window from being resized when a document containing that plug-in is loaded. - Many more new features and bug fixes, come see our user forum for details. - Arpeggiator has a new "spread" slider allowing among other things, guitar like strumming. - Dragging bar lines is now possible during playback. - It is now possible to automate and edit Aux buss return pan and volume. - Shift now affects all automation on audio tracks. - Help tags added to portions of the jukebox and effects windows. - The maximum external MIDI ports has been increased from 32 to 128. Pattern UI area with 16 X 3 steps, each with quick independent control over transpose, velocity and duration via popup. remote control of Arp parameters. works with all soft synth plugs and external MIDI. now available for free for Metro SE and Metro LX users. - The entire remote control window and functionality is now available for free for Metro SE and Metro LX users, including built-in preset support for Tranzport, Alphatrack, Axiom and more. If anyone adds support for other devices please send us the preset to share with everyone. - Smarter about what is shown below a MIDI/Audio track when in controller view. - Time signatures are retained. - Keyboard window position and Arpeggiator data stored in documents. - Improved Leopard (OS X version 10.5) compatibility. - Dragging files to Metro while a modal dialog was active could have caused some problems. - The new feature of default outputs implemented in 6.4.1.1 caused several problems. When a track insert MIDI plug-in was assigned it may have been difficult to add a synth to a new track. Pasting was not correctly assigning outputs in certain cases. - It was possible that the graphic editor track selection popup would default to a track that did not exist. - If no MIDI devices are selected on startup a MIDI Setup dialog is displayed. This now occurs later in the startup cycle. - A possible crash relating to offline plug-in processing has been corrected. - The position and order of windows are restored correctly upon document load. - A problem whereby weird things could occur when trying to automate a aux pan knob. - Inserting time into a frozen track was not working correctly. - A crash was occurring trying to parse some audio files when a QuickTime version less than 7.0 was installed. - Rhythm Explorer was not generating data using the selected time signature in some cases. - Importing an audio file with no other tracks, now correctly sets the tempo. - updated remote control preset for Tranzport. This allows shift-rotary knob to control the jukebox volume when jukebox is active. - Expanding loops no longer duplicates special bank and program events. This could cause hiccups during playback to some devices. - A crash could have occurred if notes were pending to be sent to a Virtual Instrument during document open. - Miscellaneous bug fixes and other enhancements. - Keyboard window fully supports note entry via the Macintosh keyboard, mouse wheel support for modulation, multiple velocity entry methods and more. Also useful for step entry. - Duplicate command. Copies and pastes data without using the clipboard. - Support for note nudging in the graphic editor when in average velocity view. - The drum view of the graphic editor now defaults to using note names and displays them in decreasing pitch order. - Recent file menu has been increased from 35 to 75. - Support for shift-tab when entering chords to go backwards. - Support for Shift-[ and Shift-] to extend the selection and include the previous or next note respectively. - Support for the Esc Key to deselect note events in the graphic editor. - Support for nudging the durations of selected notes in the graphic editor with Command arrow keys. - Recently used plug-ins are saved immediately after instantiation instead of on exit. - Grids now display at triplet intervals in the graphic editor when the triplet (3) is selected. - Better support for track insert plug-ins. The audio output of the plug-in will only mute now if all the tracks assigned to this plug-in are also muted. - Floating windows are consistently marked with a 'ƒ' in the windows menu if they are visible. - A Plug-in edit windows visibility is restored properly for undo/redo. - Double clicking in the tracks window presents a more appropriate view in the graphic editor. - A remote crash could occur after playing the jukebox if a plug-in was instantiated. - The sequence name is not erroneously overwritten when importing MIDI files. - When zooming out in the graphic editor, the Bar header numbers can now span more than one bar. Previously they would disappear. This makes it much easier to recognize the bar even when zoomed out. - Wait for note mode while in audio sync. - Auto repeat keyboard events are processed much more quickly. - The tempo was erroneously being changed when importing audio in some cases. - Switching apps during mixdown could cause the tempo to erroneously change in certain cases. This would adversely impact the mix. - VST presets were not being imported because of endian issues on MacIntel machines. - Improved VST and AU plug-in support. - Dragging a plug-in from an aux buss to a track or visa versa could have resulted in the plug-ins output not being set. This would mysteriously silence the plug-in in some cases. - The enter, Esc and return keys now work in the destructive plug-in editor dialog. - Canceling the qualification dialog would cause the recent plug-ins menu to be cleared. - Playing audio through an aux buss now works more reliably. - Improved plug-in latency compensation. - Faders volume knobs were being positioning incorrectly in the mixer window when chasing master volume. - A crash could occur when recording long sysex messages on certain MIDI devices. - Better support for restoring plug-ins after a paste operation, especially across documents. - Assigning remote control effects parameter to bypass now works. - Works around a bug in NI's B4 plug-in. - Better support for changing an AU's input and output counts and also restoring them upon document load. - Undoing certain operations could cause a crash. - Inserting a note by using the pencil key over the vertical keyboard would in some rare cases fail. - Much smoother graphic editor horizontal scroll wheel support. - A crash could occur if a section was deleted while not playing. - Other miscellaneous bug fixes and enhancements. - Sidechaining on a mono audio track was not working properly. - Sidechaining pre-fader was broken if the sidechain was on an aux buss. - A crash could occur when more than 128 outputs were active. - Mastering. A chain of plug-ins can now be placed on the master causing all tracks and aux busses to process through the chain before being sent to the final stereo output. In the full version of Metro there is now a Master track selection from the tracks popup. The master track has a settable duration, can be looped and can be muted. Muting the master track causes the effects chain to be bypasses which can be useful if you want to addition a recently rendered mix to a track. If an effect is placed on the master buss, the master VU now displays the actual audio signal level instead of simulated audio+MIDI level. - Side Chains. Metro will now send track audio output or aux buss output to multiple plug-in inputs. Plug-in inputs can be specified by control-clicking the title bar in the effects window and specifying the appropriate source audio. If post is selected the data will be send to the plug-in post fader otherwise it will be pre-fader. For aux buss sources the source is pre-fader only if the aux is feeding data to a lowered number aux buss otherwise it is post fader. - The number of plug-in's audio inputs can be selected in the effects window (AU only). - Aux busses can be looped, have a settable duration and can be muted in the graphics editor (full version only). Muting an aux buss will mute the effects chain on that buss. - The last selected audio sample rate and sample bit size is now saved and restored with the audio device. - Real-time display of MIDI notes while recording. Since the data is immediately moved directly to the track this feature results in an improved loop recording experience as well. - Multiple effects in effect chains can now be selected. - Dragging plug-ins from the plug-ins window to the graphic editor, tracks window or mixer window is now possible. This makes it possible to convert an aux buss plug-in from a track insert and visa versa. - Strict profiling of plug-ins option in general preferences. This causes Metro to create a report of the timings used by various plug-ins. This report will appear in the system console. This option, when enabled will cause Metro to stop playback if a plug-in uses too much CPU time. - Effects window GUI rack is complete with new 'Del' (delete) buttons. This new GUI is switchable and can be turned off from the effects window contextual menu popup. - Effect window plug-ins rack color can be specified by control-clicking the name in the effects window. Colors default to the corresponding specified category in the plug-ins window. - Effects window contextual menu item 'show in plug-ins' finds the currently instantiated plug-in in the plug-ins window. - Effects window now has a down pointing triangle allowing the direct instantiation of a plug-in. - Effects window now auto resizes when a plug-in is inserted or deleted. Current track's output volume, Current track's output pan, Pitchbend for output, convert MIDI to computer keystrokes, Timeline position, Play Automation Enable, Record Automation Enable, Next Window, Set Mode, Set Effects Number, Set Effects Parameter Number, Set Track Effects Parameter, Aux Send Volume, Aux Send Pan, Aux Select, Load Plug-in, Master Volume, Timeline Shuttle. - Multiple Remote Control presets can now be selected by holding the shift key while selecting a preset. - Undo restores the size of the effects window. - The LX version now supports bit rates up to 32. - Mixing audio tracks now handles master volume automation. When freezing the master volume is set to max and master effects are bypassed. - The last used tempo is saved and then restored when Metro restarts. - Audio and Aux Send volume are now displayed in dB within the graphic editor window. - Outputs are automatically added when expanding by channel. - Clicking on a drum name in the drum editor now always plays the drum note. - When recording new material on a track the playback bar follows the track record position. - Shifting of continuous data with the arrow keys in the graphic editor is now possible. - Aux send volume and pan views are now selectable for plug-ins in the graphic editor. - Support for hot-plugging audio and MIDI devices. - Inserting notes using the vertical keyboard of the graphic editor will use the current playback time during record. - Markers are now drag-able in the graphic editor. - If the last selected audio device is no longer available Metro brings up the audio device setup dialog upon start up. - Metro now correctly saves and restores the currently selected Metronome audio port. - Copy markers as chapter text from the markers window popup. - Contextual popup menu in the sections window adds two new options. Clear and add. The add functions provides a way, for the first time, to add sections to the section window beyond the default without having to import multiple MIDI files. - Plug-in editors are now completely closed when their window is, unless the control-key is held down. - Add new outputs now assigns the first newly created output to the track. - The Mixer contextual inputs menu now shows the jukebox output. - New contextual master fader menu allow simple creation of a master volume fadeout which works on the current selection. - Sample accurate on-the-fly recording. - Jukebox meta data (e.g. name, artist, etc.) are extracted from Quicktime audio files. - Several menu items have been added to the track contextual menu. - Rescan button added to the digital audio setup dialog box. This will re-scan for devices recently added (e.g. Firewire USB). - The last selected plug-in parameter displayed in the graphic editor is now remembered for each plug-in instance. - The shift-page-up, '<', Shift-page-dn, and '>' keys scroll the graphic editor without the use of a mouse. - Manufacturer names are now automatically extracted from VST plug-ins after they are instantiated. - The maximum number of supported inputs and outputs for VST plug-ins has been increased to 24. - Ultra Rhythm Explorer has a new popup to specify track type. - Additional information has been added to effects window contextual menu "get info" command. - Duration dialog adds the option to scale durations from a starting percent to an ending percent. - Duration dialog adds the option of trimming overlapped notes leaving a user specified gap. - Program names for Synapse Hydra plug-in included. - Drum set definitions for FXpansion GURU and XLN Audio Addictive drums included. - Vastly improved real-time audio support. Many audio operation now do not need to stop the audio engine before proceeding. - Lock-free threads for audio recording. - Better detection and handling of malformed MIDI files. - Undo was not always restoring the selection correctly. - Better handling of zooming (green '+' button) of windows. - Better finding of audio files when moving bundles from different computers. - Dragging a MIDI file to the graphic editor or tracks window was not placing markers, and other MIDI meta events at the correct time. - In certain cases importing a MIDI file would destroy the entire undo history. MIDI file import is now undoable. - MIDI file time signature are now ignored when dragging MIDI files in place to the graphic editor. - Sometimes importing a MIDI file would not set the number of measures correctly. - After importing a MIDI file the current section was not always being selected. - Using the selection filter could have caused a crash. - Many menu items are now selectable while playback commences. - Undoing an expand by channel works better. - Expand subsections was not working correctly when selected from the graphic editor. - The resultant track length was not being calculated correctly, on expand subsection, when the parent subsection's track was looped. - Using the scroll wheel to scroll an unselected pane in the graphic editor would sometimes flash the program field. - Better support for mono audio input devices. - Pasting of markers was not working quite right in certain cases. - Remote control was not working if the graphic editor was in step entry mode. - Works around a IK Multimedia Sampletank 2.2.2 problem whereby they changed their VST plug-in signature. - Better latency compensation support for devices like Access Music's Virus TI. - In certain cases a track could become silent after pasting data. - Selected song building loop record mode was having an adverse affect on punch-in recording in certain circumstances. - A crash could occur if a document was opened where notation was previously open but now is not. - A crash could occur when using the new version of IK Multimedia's Sonik Synth 2. - A crash could occur when very long marker names were used. - A crash could occur if an AU plug-in tried to update its factory presets (e.g. CheezeMachine). - Many new OS X compliant dialogs. Almost every dialog has been rewritten. - Better VST 2.4 support. - Miscellaneous other bug fixes. - Support for OS X window groups feature for plug-in editors. This fixes a minor compatibility problem with KeytoSound Nexsyn. - In certain cases undoing an operation would not properly restore the selection. - Better transpose results with the from/to scale options. - Shifting MIDI continuous data in the graphic editor with the arrow keys now works. - It is now possible to view MIDI data on frozen audio tracks if any exists. - Dragging files from the finder or other applications works more reliably. - Dragging a single MIDI file while playing was causing very strange and unpredictable behavior. - Better support for audio devices with only a single mono input. - Groove quantize was not working properly in some cases. - Changing the sequence length while playing could cause the metronome to mess up. - Track VU meters were not being set properly to stereo or mono in some cases. - The Apple DLS MusicDevice's reverb button has been removed since reverb amount can be specified in the editor. - Dynamically created program name lists were errantly being disposed of in certain cases. - A plug-in's default preset name was not properly being restored when a Metro document was re-opened in certain cases. - Worked around a problem where IK Multimedia changed the signature of Sampletank 2. This allows older documents to load properly. - Automation works more reliably. - Audio play through works more reliably. - The data display was not automating properly when an aux page was selected. - Routing of audio data from aux buss multi-outs works more reliably. - Automation data was getting messed up in certain cases if the sample rate was changed. - Copying and pasting automation data from aux busses works more reliably. - Fading a 32 bit float audio file was unnecessarily clipping. - Mutes and solos in the mixer with soft synths were not working quite right. - Enabling the loop icon during playback would sometimes make soft-synth tracks start playing the loop at the wrong time. - Groove quantize was not working for factory grooves on Mac Intel machines. - In some cases the continuous data display was incorrect. - Using the mouse wheel to scroll an unselected pane in the graphic editor would cause the program names field to flash in some cases. - Vastly improved compatibility with Access Music's Virus TI plug-in. - Better CoreAudio support for half duplex devices. - Certain undo operations would not restore the track selection correctly. - Inserting an event from the section event editor would clear the entire undo history. - In some cases Mixing audio could be slowed by continuous unnecessary refreshing of the graphic editor. - Recording of MIDI volume and pan information would fail in some cases. - On Intel macs only, real time audio track edits would occasionally send a small amount of bad data (big-endian) to plug-ins causing them to sometimes crash, spike or go silent. - Software audio play-through is now automatically disabled if a direct output is selected. - On rare occasions it was possible that audio recording could miss a buffer if the thread priority was set to anything other than none. - A rare crash could occur if there were no MIDI devices. - The jukebox would incorrectly try to add ID3 tags to .MP4 files. - Automating on a track assigned directly to a port was creating an automation track with no output assignment. - Better AU and VST 2.4 compatibility. - Dragging MIDI or audio data from certain plug-ins (namely Phatmatik Pro) was being ignored in some cases. - Dragging MIDI or audio files from the finder or other applications could have resulted in a hang. - Markers without any text are now ignored when Importing MIDI files. - Errant Time signatures in MIDI files are now ignored. This may have caused a crash on Intel Macintoshes. - Sometimes importing a MIDI file would not set the tracks length correctly. - Clicking below the lowest drum in the graphic editor drum set view could have caused a crash. - Changing the tempo via the section events window could cause problems with automation on audio tracks. - Plug-in parameter values were not being endian swapped properly on Intel Macintoshes. If a plug-in has its 'Plug-in manages presets' contextual menu item checked, then plug-in parameters will now be ignored when the Metro file is loaded. This makes it possible to open saved 'PianoTeq' documents. - Deleting the first plug-in in a chain of plug-ins could, in certain cases, make the track output silence. - Automation would occasionally occur on a wrong track and the mixers contextual menu item 'store automation at start' could have caused a crash. - Using the mixers contextual menu items for automation now correctly places audio automation on virtual instrument tracks. - Muting mixer channels no longer sends MIDI volume of value 0 to virtual instruments since the audio output will be muted any way. - Rearranging the order of a chain of plug-ins and then undoing it could result in a hang. 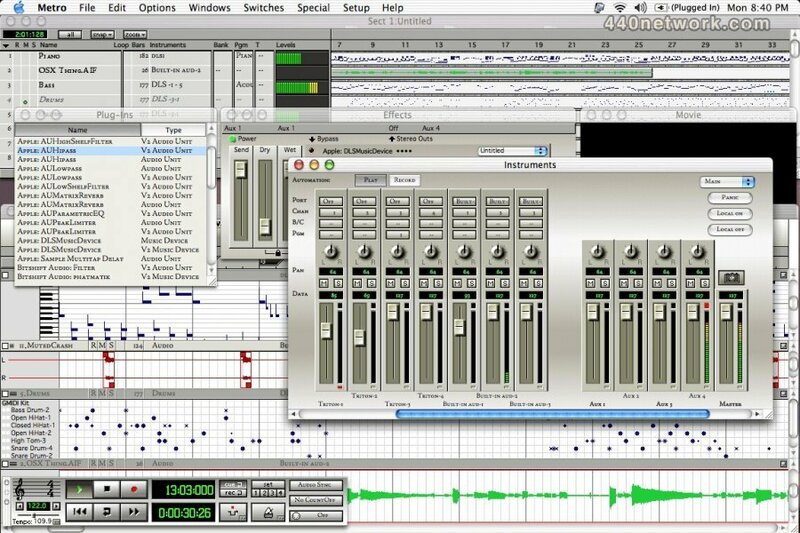 - Using the scale time dialog could have caused problems with automation on audio tracks. - The maximum number of outputs a VST plug-in can have to be supported by Metro has been raised from 20 to 24. - When auto-assigning a mixer channel and finding an unused one, Metro now resets the volume and pan of that channel. - When starting Metro and with no visible windows, recent menu items would not appear. - Video Thumbnails were broken in version 6.3.8.3 (full version only). - Holding control while closing an effects edit window will now close the editor completely. This works around a problem with Arturia's Moog Modular whereby the editor uses up much of the processor time even when the edit window was hidden. - Recording MIDI from a plug-in is now disabled unless the user explicitly selects 'Record MIDI' from the effects window's contextual menu popup accessed by control-clicking on the name of the plug-in. Previously, since recording was always enabled, this could cause seemingly spurious MIDI events to be sent in MIDI through. - A new option in the plug-ins window contextual menu, adds support for AudioUnit plug-ins which do not support sample accurate automation (namely PSP's). - Better VST 2.4 compatibility. - Metro was not reading/converting old Metro 4 data files correctly on Intel Macintoshes. - In very rare cases it was possible that an operation on section events (time/key sigs or master volume) could cause automation on other tracks to become messed up. - Importing a MIDI file was leaving the file open in some cases. - Inserting Master volume events via the continuous data dialog during playback would likely fail. - Audio scrubbing was not working correctly. - Setting the selection filter to the first n of m notes, could cause a crash. - In rare cases, when working with an aggregate audio device, it was possible that the device would stop responding requiring an audio reset to get the device back. - Transpose was changing the selected notes in some rare cases. - Entering text via the keyboard was causing crashes in older carbon based VST plug-ins (PPC only). - Software audio through was broken on Intel Macs when the recording bit depth was set to 32. - Software audio through would not restart after clearing an entire record-enabled track. - If audio glitches occurred, the play bar would be out of sync with the audio. - If a key signature event occurred at the same exact time as a Tempo change event, the tempo could be messed up for virtual instruments. - Selecting a new folder or adding files to the existing Jukebox while the Jukebox was playing could have failed. - Selecting a new track output would not mark the document as changed. - EFX Automation was not always displaying properly. - Modifying a note velocity using the arrow keys was not marking the file as changed and therefore allowing a quit without asking to save first. - Opening movies was broken in 6.3.8. - Playing/Recording movies was a challenge with an aggregate audio device. Aggregate audio devices now work but are not recommended for use with movies because of a serious bug in Apple's Quicktime. - Tempo changes from MIDI files are ignored when a MIDI file is dragged directly to a position on a track. - It is now possibly to keep a cue loop going after dragging a MIDI file to a track. - Remote control was not working before or after a punch-in record session. - Dragging audio to a movie track was causing a crash in certain instances. - A major delay was occurring while Metro was trying to find a movie it had already deleted (doh!). - Recording video + audio from the middle of a track now places the audio in the correct position. - Plug-ins on Intel Macintoshes now default to having their edit windows being composited. - It was possible to crash by clicking to the right of the master fader in the mixer window. - Sample accurate AU EFX automation was not working 100% correctly. - Virtual Instruments (VI's) can now have their audio volumes and pans automated. A new display mode of the graphic editor allows the selection of audio volume and audio pan for VI track types. - Metro now finds MIDI input devices even when their uniqueness changes. This works around a bug in MIDIkeys. - MIDI track input selection is much more versatile. Any combination of MIDI channels can be selected on input with the new submenu popup in the tracks window. - Metro now defaults to Apple's generic Audio Unit interface if the plug-in does not have one. This is configurable on a plug by plug basis in the plug-ins window. - The audio fade dialog has been improved. - A remote control preset for the M-Audio Axiom controller. - Cosmetic problem when Mixer window was sized too small. - Problem with data ranges in the continuous data display of the graphic editor. - Bypass automation was not limiting its values to just on and off. - MIDI data was not being drawn underneath continuous audio volume and pan for Virtual Instrument tracks. - Removed an annoying flash that was occurring on open and new when transport was floating. - The continuous data dialog was not displaying the title of the select data correctly in some cases. - Selecting float transport window from the switches menu while the transport was not visible would cause the transport to not redraw correctly in some cases. - Initial import of audio was not extracting the tempo from the audio file in 6.3.7. - If an input audio port was out of range no error message would occur until recording in some cases. - Recent plug-ins could mysteriously disappear in some cases. - Automating pan was excruciatingly slow in some cases. - The countoff was counting 1/2 as long as it should in some cases. - Minor correction when automating Audio Unit parameters. - Better support for automation only tracks. - Certain Audio and MIDI tracks were not being muted properly during record. - A problem whereby Metro would try to close a non-existent CoreMIDI connection if a selected record MIDI device recently came online. - Undo of record now properly restores the select track range. - Jukebox now correctly parses the full OS X file name. - Old Rhythm Explorer presets now default to staccato = 50% instead of 0. - In some case recording audio through a plug-in like 'Apple:Pitch' would not initially playback properly. - The contextual tracks window output menu would not always show the correct connection if a track was frozen. - Clicking on the tempo door of the transports more than once was causing a problem. - Selecting 0 in the scale time dialog could cause a crash on Intel Macs. - Scale time would not always set the track length appropriately. - Using return when in 'editing mode' no longer moves the graphic editor display. New: Metro makes vastly improved usage of available CPUs with the new core audio option 'Thread Priority'. The setting of 'none' is what all previous OS X versions of Metro used. Metro now defaults to 'medium'. - New: Metro LX supports up to 24 audio tracks now and 24 effects (or 6 synth plug-ins) simultaneously. - New: Typing in numeric values in note fields is now acceptable. For example, 60 = c3. - New: The duration dialog has been rewritten to be more OS X like. - New: A new View type of drum editor, Drum Bars, has been added to the view menu. Documentation on this is forthcoming. - New: Option-clicking on a drum solo button clears all solos. - New: Importing sysex from a .ins file now sets the sysex event name. - New: Intel Mac optimizations. Including automatic disabling denormalization in the audio engine. - New: Using an aggregate audio device no longer results in long delays when play is pressed (in most cases). - New: Intel mac and improved ReWire support. - New: Direct support for Logitech mice with horizontal scrolling. - New: OS X dialog when the demo versions time out. - New: The bank selection in the graphic editor follows bank selections sent through MIDI thru. - New: Expand is now possible without stopping play back. - New: The Notation engine is now lazily initialized. This means if the Notation or Lyrics window is never opened, significant memory resources are conserved. - New: The currently playing jukebox entry is now denoted with a red triangle. - The master fader's clip indicator is now working. - Automation record now works on empty tracks. - MTC sync is now fixed. - AU plug-ins output re-configuring has been improved. - A possible crash could occur when attempting to transpose an audio track that contained no data. - Pressing stop while recording the Ultra Rhythm Explorer might not record the last pattern change. - The Ultra Rhythm Explorer has been improved including new preference field for legato/staccato and a new variability slider. - Insert Random Chord Progression has been vastly improved. - The Contextual menu showing the track, mixer, effects and graphic edit windows output routing has been improved. - Inserting time could cause events to become temporarily out of order. - A bug introduced with sample accurate AU automation, was sending bogus data to certain AU plug-ins during automation play back. - Pasting audio data onto a pure MIDI track is now impossible. - The Metronome port setting is now retained across Metro sessions. - The Metronome was not playing properly if assigned to a soft synth. - Improved internal Metronome support. - Soft-synth could play extra data on the last loop iteration if independent track looping was enabled. - Dragging a plug-in to a graphic editor slot was not always loading the plug-in on the selected track of that slot. - Using the contextual menu item 'To Track' in the plug-ins window used to place the plug-in on a new track but now places it on the currently selected track. - Upon loading of a Metro document the order of plug-in windows was not being restored properly if the transport was in a different floating state than when the document was saved. - If the jukebox was frontmost when a document was opened it was possible that the transport would disappear. - Opening older Metro program name documents was failing on Intel Macs. - The default controller (or plug-in parameter) was not being endian swapped and thus would not work when a document was transferred PPC to Intel or visa versa. - Importing a type 0 MIDI file did not always set the track type to MIDI. - Importing Quicktime MIDI files did not add the files to the recently imported MIDI files menu. - Certain real-time operations would set the play position of soft-synths incorrectly. - Creating notes, via chord mode or insert chord progression, on a bass track will automatically lower the notes one octave. - The change port dialog has been improved. - The velocity algorithm in groove quantize has been slightly improved. - Pasting past the end of track in real time now sets the track position correctly. - Mousing numeric fields has been slightly improved. - Independent track looping has been improved and is no longer dependent upon MIDI data existing. - The bar, beat, clock readout in the graphic editor no longer is quantized based on the note edit quantize setting until something is dragged. - The glitch dialog no longer pops up after quit has been selected. - On older systems it was possible that the G4 vector unit would not be recognized causing Metro to quit even though it was running on a G4. - Pressing the 'esc' key while Metro is loading causes it to stop searching for plug-ins. Previous to this version it would also permanently remove items from the Graphic Editor's plug-ins menu. - Better ReWire error messages. - Since 6356 certain windows would not be deactivated properly. - The cursor changes more appropriately in the drum editors. - Dragging at the sample level has been improved. - The internal Metronome is improved when syncing to MTC. - VST Automation has been improved. - A crash could occur when loading a plug-in with an odd number of outputs (> 1) on a track. - Metro no longer sends the selected bank select message more than once when looping. - The Ultra Rhythm Explorer Phrase Arpeggiator algorithm has been substantially improved. - The find program dialog has been improved. - When attempting to apply an offline effect on an Audio + MIDI track, Metro would erroneously report that no audio tracks were selected. A crash could occur when selecting a Metro output of a non-selected track in the tracks window. - Some problems with subsections have been corrected. - RNotes (Random Velocity Notes) are supported correctly in the new note edit dialog. - Changing different plug-ins when in continuous efx automation views could fail to refresh properly in certain instances. - VST plug-in editor windows would come up blank on the second edit. - New output is now always created when loading a soft-synth as a track insert. - Master fader VU is no longer updated for softsynths since the audio level of the softsynth is king. - Possible crash when stopping playback while direct-recording with software audio thru on. - Possible crash when expanding subsections with a frozen audio track contained in the subsection. - Program names loaded from the program names dialog on soft-synths ports were not being remembered correctly since Metro version 6.3.3. - The Jukebox was creating an internal error if certain OS errors occurred. - The Subsection edit dialog did not refresh the color swatch after it was changed. - New plug-in option for plug-ins that cannot be re-initialized (USB:Ultrafocus). Accessed, as usual, by a right-click or control-click on the plug-in in the plug-in's window. Sagan Technology has announced the release of version 6.5.0.1 of Metro, the complete cross-platform digital audio workstation solution for both Windows and Mac users. Metro and Metro SE are available now directly from the Sagan Technology Store. This is a follow up to the first review in reference of the last paragraph. The application is very easy on the eye and also have the option of changing to different color schemes. My favorite is Low Tech. I did say I needed to figure it out. So, here it is. Anyone else? Or is it just me? I moved to Metro SE, when it was at version 6.2.2 or somewhere around there. About a month later I upgraded to the full blown version and have kept up to the latest. I used to use DP and granted no software is perfect and I'm not knocking it down either, but I just got to where I could not stand the crashing anymore so , I demoed Metro and have been happy ever since. I think that says it all. About the developer... He's top notch. Questions are answered within the hour and bug fixes/updates/new features, are frequent. One thing I have noticed and that's from my own experience, than again it might just be me, is that I seem to work/spend more time on the computer doing music, then when I was working in DP. I have not tested this yet, and don't know what it is, but I will when time is available and will re-post. I have been using Metro since July, 2005 and it has been like a breath of fresh air. No other DAW on OSX is as stable or CPU efficient (uses between 10 and 50% less CPU than others I have tested). I rely heavily on virtual instruments and effects plugins and Metro is very flexible in that respect - it supports both AU and VST formats. And, because of the CPU savings, I'm able to run more of them. My company produces multimedia content, of which audio plays a large part. Although I own other DAWs, I use Metro for commercial projects because I can get through a project very fast and without having to worry about my next crash or CPU spike. Surely Metro cannot do everything Logic, DP, etc. can do, right? Yes, every DAW has some feature or quality that can distinguish it from the others, Metro included! That said, I have had far more trouble trying to get other DAWs to do what Metro does than the other way around. This is a pro application (I use the Full version). What's not to like? Well, the UI is not as pretty as some of the others out there (unless you love gray). That said, the UI is highly optimized and doesn't try to force analog metaphors gratuitously. Since the routing is very flexible, it may take a few times to get used to the available options. The good news is, for beginners, those advanced features don't get in the way. Metro is owned and maintained by its original programmer, Jeremy Sagan, and his company is very responsive to tech support questions and feature requests. Updates and bug fixes are frequent (keeping up nicely with the constant changes to OSX and Mac hardware). It should be said that I'm not big into software loyalty - I consider Metro to be a tool to get my work done and an environment to create my art. At this point, it is my tool of choice. Check out the demo. Séquenceur Audio Et MIDI. Métro SE est une version allégée de Métro, certaines fonctions non esssentielles ont été éliminées pour pouvoir offrir un produit à un prix incroyablement bas.